It was good to see the appearance of the second issue of Zembla. It gave hope that this audacious new literary magazine might actually last. Reactions to the first issue from the press and ordinary readers were encouraging. 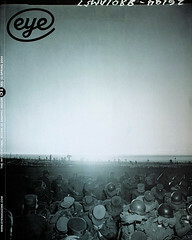 People seemed ready for its combination of good writing, inventive editorial ideas and contemporary design. The second issue contains full-page ads from D&AD and the Magma design bookshop. How many literary publications achieve that kind of design-scene awareness, let alone so fast? Vince Frost was an inspired choice as creative director and, though he has now moved to Australia, he will continue to design Zembla with Matt Willey at Frost Design. The obvious comparison is with McSweeney’s, also celebrated by design enthusiasts, but this is not quite the same. McSweeney’s is an occasional publication rather than a regular magazine and you can’t pick up a copy on the (British) newsstands. Zembla, published five times a year, sits alongside the current affairs, lifestyle, sports and hobby titles, and in that visually pedestrian company its eccentric Z-shaped titlepiece is something special. The magazine’s aim, signposted on the cover and repeated in editor Dan Crowe’s editorials, is to have ‘fun with words’, and the design certainly conveys that feeling. It’s bright, energetic, irreverent and playfully unpredictable, suggesting that literary subject matter should be seen as a fashionable modern pursuit. Manolo Blahnik is a contributor and Brian Eno and Tilda Swinton, the first issue’s cover star, are also involved. It would be wishful thinking to imagine that a literary magazine could ever achieve the broad impact of, say, Wallpaper*, but that’s the kind of coffee-table company it would evidently like to keep. How much graphic cheer-leading, though, do readers actually need? In the second issue, an otherwise enthusiastic bookworm writes: ‘a bit over-designed in places . . . For a mag you’re supposed to read, it ought to be comfortable on the eyes. Bloody designers!’ In issue no. 1, the entire text of one story was reversed out of a black panel which was cropped tight around the text area, forming a ragged right edge against the white of the page. There is nothing as pointlessly obstructive in the second issue, but there are still moments when the typography misjudges the writing’s tone. In a superbly insightful essay by Robert Macfarlane on the late German writer W. G. Sebald, who scattered his texts with photographs, the designers put Sebald’s quotations into Arete Mono, Zembla’s mono-spaced, block-like display face, shattering the mesmeric rhythms of his haunting, antiquarian prose. (It’s lucky that there are several paragraphs where the editors and designers appear to have forgotten to do this.) A witty, beautifully written ‘interview’ with long-dead novelist Henry James by American essayist Cynthia Ozick suffers from the same jarring voice. Sometimes the designers really seem to struggle to decorate these long carpets of text. A story titled ‘Brownies’ by Z. Z. Packer receives eight massive, page-sized ‘Z’s printed in brown, which slash into the columns. Frost has always loved big, battered chunks of type, but this is much too literal and thin. While there is clearly a need to make the feature pages as enticing as possible, this seems best achieved by alternating longer texts with visual features, like the magnified images of insects in the first issue. Zembla’s design flourishes are most effective in the regular items and shorts, such as the contents spread, the ‘Notebook’ news section, the reviews, and publisher Simon Finch’s competition page. The photo-graphs of early editions, including an experimental novel by B. S. Johnson, a figure overdue for revival, are mouth-watering for book lovers and collectors. They should show more. These pictures are also a reminder of what Zembla is about. Books might make trendy accessories, and ‘fun with words’ is a welcoming slogan, but reading is a quiet, inward-looking and – there’s no way around it – time-consuming pursuit. Granta, a long-running success, is the size of an ordinary book and its pages resemble those of any paperback. The argument against taking this approach (I recall hearing it from Tibor Kalman, who wanted to redesign Granta) is that this looks boring and puts off some people. Yet, if you are a committed reader, the only thing you really need from design and typography is basic readability. The typographic detailing of a page can subtly infuse perceptions of a text, but once you are lost inside longer prose this is a minor aspect of the reading experience, except where it gets in the way. Zembla has large pages to fill and unrelieved columns of solid type would be overwhelming. The challenge is to use design as a beacon and framing device, then to let good writing cast its spell.